The Europeans have staged quite an invasion on the PGA tour in recent years. Not too long ago, Irishman Graeme McDowell won the U.S. Open. His good buddy and fellow countryman, Rory Mcllroy, won for the first time on the PGA Tour at Quail Hollow and then battled down to the wire at the Masters. And Englishman Ian Poulter won last year's World Golf Championship Match Play. In addition to winning, these guys have brought some new styles to the Tour. 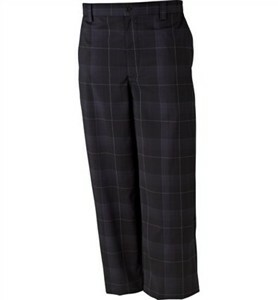 These Snake Eye Plaid Pants looks like something Ian Poulter would wear. On second thought, the color would probably be too dull for him. He seems to like the brighter colors. Him and John Daly are having a secret competition to see who can get the most attention. Neither of their styles appeals to me, but if I had to pick, I’d go with Poulter. He usually dawns bright pastel colors that are color coded right down to the sunglasses and shoes. The pants are usually plaid, either pink, green, orange, peach, etc. but he usually tones it down (a smidge) with a sweater or jacket. In contrast, John Daly’s outfits look like those ugly 80s pants that the NFL players used to wear on the sideline. I would compare the styles to pajamas, but that would be insulting pajamas. Whereas Poulter’s clothes look more classy (albeit loud), Daly looks plain stupid – and again, that is an insult to stupid. Needless to say, I'm not ready to dive in to the hot pink or teal-colored plaid, but I really like these grey plaid pants. They are stylish without being too flashy. Although, I still will take some ripping from the guys in my foursome. I really are flat front. (Pleats have gone the way of the sweater vest and the black and white shoes.) And I enjoy making fun of my golf buddies when they show up in their old pleated pants. Those are soooo 2002! You have to go with the flat front now and if your shoes are multicolored than they should be more modern. And don’t thing I’m going form over function on you.. In addition to being stylish, these trousers are made with a little spandex to allow them to stretch with you as you play the links. This is something you may not pay attention to, but it really makes a different especially if you are walking 18 holes. The pants move with you and stretch with your golf swing. But don't worry -- it's only 5% spandex; they won't fit like your yoga instructor's skin-tight exercise pants. I would never do that to you! Pink Nike Dry Polo to go with the pants. Or, to really creep out your golf buddies, get this Ian Poulter head cover. And finally, if these pants are not for you, see our other Men's Pants reviews here.